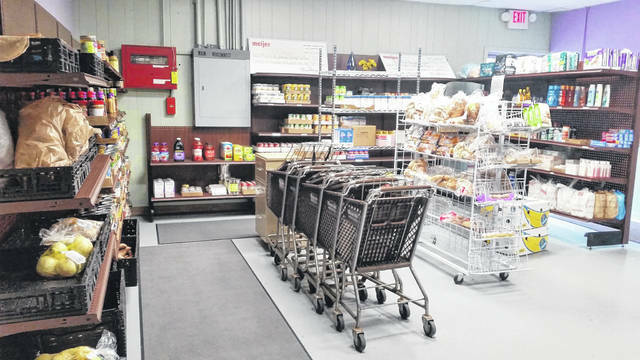 BELLVILLE — The Bellville Neighborhood Outreach Center (BNOC) and Meijer are once again teaming up to provide hunger relief in the Clear Fork Valley through the retailer’s Simply Give Food Pantry Donation Program. “The BNOC services 110 square miles in the Clear Fork Valley. We usually see around 180 clients per month, which supports over 500 individuals who are in need,” said Carol Hoeflich, BNOC food pantry manager. The Meijer Simply Give campaign helps to replenish the shelves of more than 240 food pantries in Michigan, Illinois, Indiana, Ohio, Kentucky and Wisconsin. The program encourages customers to purchase $10 Simply Give donation cards, which are then converted into Meijer food-only gift cards and given to a local food pantry in the store’s community. Meijers Simply Gives has designated Dec. 7 as Double Day when they double the amount donated instead of just a single match. That means on Dec. 7, a $10 Simply Give donation card will mean $20 worth of supplies for Bellville outreach center. But all Simply Give cards sold at Meijer in Ontario will benefit the Bellville Neighborhood Outreach Center through Dec. 29. “We encourage community members to help us fulfill our mission of helping feed the hungry in the Clear Fork Valley community by purchasing a Meijer Simply Give food donation card during their next shopping trip,” said Carol Hoeflich, BNOC food pantry manager. For the seventh consecutive year, Meijer will contribute at least $1 million to the 2018 Simply Give program. The Simply Give program runs three times a year: spring, fall and the winter holiday. Since the program began in November 2008, more than $43 million has been generated for food pantries in the Midwest to distribute to our hungry neighbors. The mission of the Bellville Neighborhood Outreach Program is “Helping to enrich the lives of those who call the Clear Fork Valley home.” It has become a community of volunteers working together to share in the commitment of helping those in need throughout the Clear Fork Valley. The BNOC strives to provide those in need with some of life’s essential items including food and clothing.